Rational equations are simply equations with rational expressions in them. We can use the technique outlined earlier to clear the fractions of a rational equation. 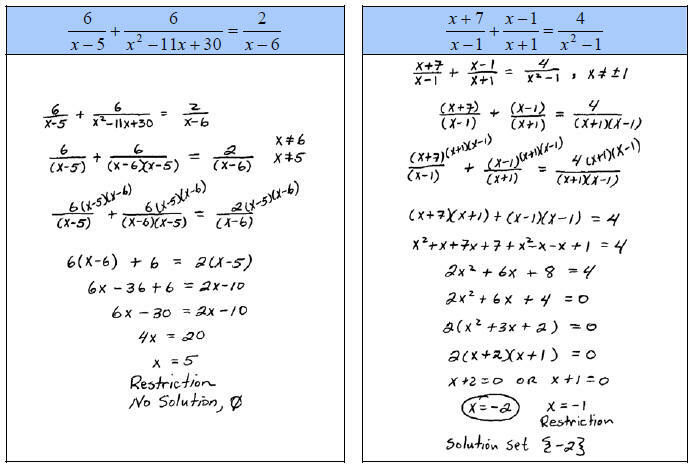 After clearing the fractions we will be left with either a linear or quadratic equation that can be solved as usual. Step 1: Factor the denominators. Step 2: Identify the restrictions. Step 3: Multiply both sides by the LCD. Step 4: Solve like normal. In this case solve the resulting quadratic equation. Step 5: Check answers against the restrictions. This process sometimes produces answers that do not solve the original equation, so it is extremely important to check them. Tip: It suffices to check that the answers are not restrictions to the domain of the original equation. Determining the LCD is the step that most students have difficulty with. When deciding what the LCD is, use one of each factor, make sure that when we multiply it cancels with all the denominators and clears the fractions. If it does not, the LCD is incorrect. If we multiply both sides by the LCD we would next distribute it through the expression. We can save this step and simply multiply every term of the rational expression by the LCD as illustrated below. It is tempting to simply multiply all the factors of the denominator together to obtain a common multiple. This will work, but usually leaves us with an equation that is too cumbersome to work with. If we use the Least Common multiple of all the factors in the denominators then we will have less factoring in the end. Bottom line, it is worth spending the extra time to find the LCD. Some literal equations, often referred to as formulas, are also rational equations. 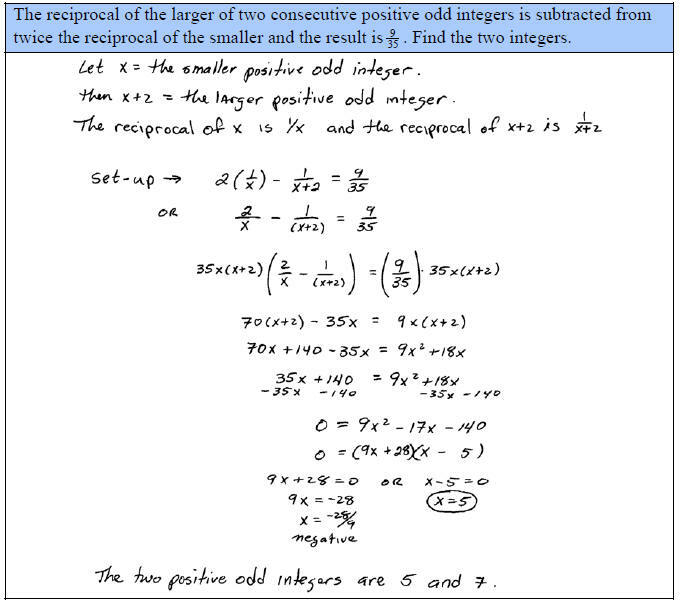 Use the techniques of this section and clear the fractions before solving for the particular variable. The reciprocal of a number is the number we obtain by dividing 1 by that number. Often we think of the reciprocal as an interchange of the numerator and denominator but this definition fails us when the number to be reciprocated is a variable.